Please refer to our stock # 1-0287 when inquiring. 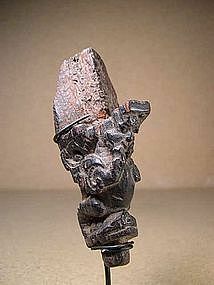 Small architectural ornament, carved in the shape of a Garuda, standing under a triangular platform with his wings open. Wood, fine dark patina. Nepal, 18th century, probably earlier. Height: 4 1/8" (10,5 cm). The piece is nicely mounted on a custom metal stand. Old traces of woodworm work (no danger), large chip on right side of platform, otherwise good condition. Note: in Hindu religion, Garuda is a demigod, half man half eagle, who carries god Vishnu.